For some reason it is easier to write about things that bother or annoy me, than things I love. I wonder if it’s just me, or a general thing. And if it works this way with writing, wouldn’t it be the same in relationships, just to name something? I mean, after a while you don’t see that that cute hunk anymore, but a bulk in bed who doesn’t throw his dirty socks in the hamper, right? I feel my relationship with Honduras has sunk to that level and I need to remind me every once in a while why I fell in love with Honduras in the first place. So here’s to things I absolutely love, adore and worship in Honduras. Avocados. Oooohhh, do I love avocados!!!! I think it’s the most perfect fruit (or vegetable, or whatever you want to call it) that nature has to offer. And especially the avocados in Honduras! Nothing to do with the rock-hard and very expensive spray-painted crap you buy back home in the supermarket and that take days in ripening. No, the best are the avocados that fall out of the tree in your back yard and that are so tasty and creamy… Guacamole is terrific, avocado in soup is also great, but I think the very best is just to cut one in half, sprinkle some salt and lime juice on both halves and spoon it out. Also great for facemask or hair packs! Can’t wait till avocado season in this part of the country (July) when they’re so nice and ripe and cheap, you can eat yourself sick of them. In April, just when you think the weather can’t get any hotter, dryer and more oppressing, it’s watermelon season. Yeah! There’re pick-up trucks on each street corner loaded with watermelons for as cheap as 1 Euro. Keep it in the fridge for a few hours and then just cut off a big chunk when you’re all sweaty and thirsty…It never ceases to amaze me how all that water actually got into the melon… For those who are interested in watermelon with piquete; make a hole in your watermelon, pour vodka in it (or tequila or rum or whatever liquor in whatever quantity), put it in the fridge for a few hours, and there you go. Not very suitable for young children. There are, in my opinion, few things I know a little about that are as complicated as the Maya calendars. I definitely don’t have a knack for math, and I guess that’s why. I’m only just able to understand why the period of 52 years is sacred to the Maya. The reason is that the Calendar Round is repeated every 52 years (=18,980 days). A calendar Round is a combination of a Tzolk’in date and a Haab date. Tzolk’in is the lunar calendar of 260 days, while Haab is a solar calendar of 365 days. This duration of 52 years can be explained because the least common multiple of 260 and 365 is 18,890 which equals 73 Tzolk’in years or 52 Haab years. Obviously I copied this information from Wikipedia, because my mind can barely grasp a concept such as least common multiple. What baffles me more than anything is that the Maya figured this out without the use of Wikipedia!!! So please don’t ask me anything about the Maya calendars. The funny thing is that about half of these images don’t show the Maya calendar, but the Aztec calendar. Aztec is a club Snooki and friends like to frequent in Jershey Shore, but the name also refers to a certain ethnic group from Central Mexico that dominated large parts of Mesoamerica from the 14th to the 16th century. They knew the Maya, they even conquered a few Maya cities here and there, but they are not the same as the Maya. The Aztecs are to the Maya as the Americans are to Canadians. Or the Belgians to the Dutch. 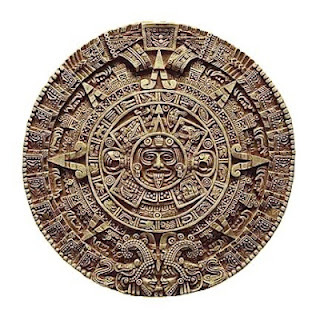 The Aztec “stole” the Maya calendar and made it their own. The names and symbols are different, but the system is basically the same as the Maya Tzolk’in and Haab calendars. The big difference is that the Maya had another calendar that was widely used, the Long Count, designed especially for referring to long periods of time. Whereas the Aztec had to start counting all over after every 52 years, the Maya continued counting since their point zero, August 11, 3114 BC, and will continue to count for ever more. One of those larger periods, the 13th bak’tun, ends on December 21, 2012. The Mayas did not started their counting at Day Zero, but at 13.0.0.0.0. Since the Long Count too is a cyclical calendar, on December 21, after 5125 years, it will be at 13.0.0.0.0 again, and a new round will start. Not the end of the world, simply the beginning of a new round of 13 bak’tuns. Bottom line, it is very silly to use an image of a 52 year-long Aztec calendar while referring to the “Maya prophecy that predicts the end of the world”. It’s actually quite funny how many “Maya experts” are using an image of the Aztec calendar for publicity purposes. Maya Calendar Stone with year bearer??? The second important thing I learned about the Maya calendars is that they work together as if interlaced together as different sized wheels. This is a great way to visualize how they work. However, the Maya calendars are, as far as I know, NEVER EVER depicted like that on any ancient Maya monument, mural or painted ceramics. The circular image of the Maya calendar (either with the Tzolk’in day glyphs or Haab month glyphs) is very popular and sells well as pendant, coaster, T-shirt design and mouse pad. You see it everywhere, with in the middle a miserable looking Maya carrying a day glyph on hs back. I guess this refers to the year bearer. The year bearer is one of four Tzolk’in days that happen to be the first of every Haab year. They quite literally carry that day on their back. But I have never seen an actual image of it. It’s most likely that it is the creation of a smart artisan and that his design has been copied over and over, turning it into something “authentic Maya”. The New Original Ancient Maya Calendar!!! And to end those rambling thoughts on the Maya calendars, let me remind you that for only $5 I’ll design you your own Tzolk’in day glyph! It will protect you till the End of Time, guaranteed!!! I’m not sure whether it’s a deeply rooted cultural difference or it’s just me, but I HATE Semana Santa! I don’t particularly dislike the religious tradition of sawdust carpets. They’re actually quite beautiful and a true community effort. I also don’t mind the processions and I do enjoy the beautiful set-up of the different stations of the Calvario of Jesus. I tend to complain about the oppressing April heat, but hey, that’s one of the main reasons for my being here in the first place. I prefer the town in its normal tranquillity, without the invasion of Salvadorian tourists, but I can live with it. But what I CANNOT STAND is being anywhere near the river these days. I love the Copán River. For almost every day of the last fifteen years, I’ve been walking along, to, or through the river with my dog(s). I love the river when the water is crystal clear and alive with tadpoles. I love it when it’s chocolate brown and roaring angrily after the first tropical downpours. I love the river at the peep of dawn and in the soft embrace of the afternoon sun. I love three-dimensional sound of the flock of oropendolas that have their nests hanging high above the river’s edge. I love the river’s steep cliffs, its rocky beach, its shady edge. But all that is now, at least temporarily, history. While Salvadorian tourists have taken over the town, the Copanecos have all gone to the river. And with them, their cars, stereos, barbecues, mattresses, hammocks, pillows, inflatable pools, pets, baby cribs, chairs, tables and tons of kids and food and disposable cups, plates, cutlery and bags. And whereas for some people it might be fun to sit next to your neighbour’s car on a tiny bit of rocky beach with your feet in the three inches of highly contaminated water with music blaring from three different sides, it’s isn’t mine. But still, cada loco con su tema. But what really bothers me is what is left behind when the sun goes down. Mile after mile, there’s trash just everywhere. So, after fifteen years of living in Honduras I still don’t understand this. Is this a typical Honduran thing, or does it happen elsewhere too? Why, if you’re coming by car in the first place, can’t you just take your trash back home with you? Why would you want to sit on a beach littered with yesterday’s trash?